Jesus calls His first five disciples. ANY PEOPLE WHO heard John preach by the riverside believed his words, and they began to look for the coming of the King from heaven. From day to day they waited, eager to hear the glad news that the King had arrived. They believed that he would set up a kingdom of Judea, like the kingdom of David had been. And they believed that the Jews would be the favored people in this great kingdom. One day after Jesus had returned from the lonely wilderness, John the Baptist saw him walking along the road near the river. And John cried out, "Behold the Lamb of God, who bears the sin of the world!" Two young men from Galilee were with John that day and heard him speak. These young men had been disciples, or learners, of John, for they were interested in the teachings of God. When they heard John's words concerning Jesus, the Lamb of God, they turned at once to follow this wonderful person. Perhaps they wondered why John had called him the "Lamb of God." And perhaps they wondered how he could bear the sin of the world. Jesus knew these young men were following him, so he stopped and called to them. He asked what they wanted of him, and they answered, "Master, where do you dwell?" Then Jesus took them with him and talked with them all the day. We do not know what Jesus told those men, but we do know that his words proved to their minds that he was the King, or Messiah, for whom the Jews were looking. How glad they were because they had found him! 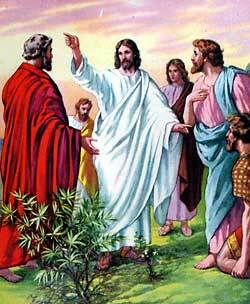 One of those young men was Andrew, who afterwards became a disciple of Jesus. Just as soon as he believed that Jesus was the promised King he remembered how eagerly his brother, Simon, was waiting to see this great person, too. So he hurried at once to find Simon and bring him to Jesus. Both Simon and Andrew lived by the seaside in Galilee, but at this time they were numbered among the many people who daily sat listening to the words of the strange preacher in the wilderness. Never had they heard such wonderful teaching before, and they were sure that John was a prophet. But Jesus' words had convinced Andrew that he had found a new teacher who was even greater than John. So he called Simon aside from the multitude and said,"Come with me, for we have found the Messiah!" When Jesus saw the two brothers coming to his lodging-place he looked at Simon and said, "You are Simon, the son of Jona; but you shall be called Peter." Simon wondered how Jesus knew so much about him, but after he listened to Jesus' words he, too, believed that the long-looked-for King of the Jews had come. And he followed Jesus with his brother Andrew. On the next day Jesus began his journey back to his home country in Galilee, and these men went with him. As they went they met a man named Philip, who lived in the same town as Simon and Andrew lived in. Jesus called Philip to follow him, too; and Philip obeyed. As he walked along the road with Jesus and the other followers Philip listened in wonder to the wise sayings of his new-found friend. He had longed for the coming of the Messiah, and now he, too, believed that Jesus was the promised Savior and King. Philip had a neighbor named Nathaniel who had often talked with him about the glorious time soon coming when the King of the Jews would appear. And now he ran to tell Nathaniel about Jesus. He knew how greatly Nathaniel longed to see the coming King, and he called to him, saying, "We have found him, of whom Moses in the law, and the prophets, did write, Jesus of Nazareth." Nathaniel knew the Scriptures, and he did not believe that the King of the Jews would come from Nazareth, for the prophets had said he would be born in Bethlehem. So he said to Philip, "Can any good thing come out of Nazareth?" But Philip answered, "Come and see." Because Philip was so eager, Nathaniel rose and followed him. When they came near, Jesus saw Nathaniel, and he said, "Behold an Israelite indeed, in whom is no guile!" "How do you know me?" asked the astonished Jew. Jesus answered, "Before Philip called you, when you were under the fig-tree, I saw you." What Nathaniel had been doing under the fig-tree we can only guess, but he may have been kneeling there and praying that God would hasten the coming of the promised King. When he heard Jesus; answer, he was filled with wonder and surprise that Jesus could know what he had been doing and where he had been staying before Philip called him. At once he believed that only God can see all things, and can reveal them to men, so he exclaimed joyfully, "Master, you are the Son of God! you are the King of Israel!" Jesus replied, "Do you believe just because I said I saw you under the fig-tree? You shall see greater things than these. Some day you shall see the heavens open, and the angel of God all about the Son of man."